There are a number of things to mention that are history related. 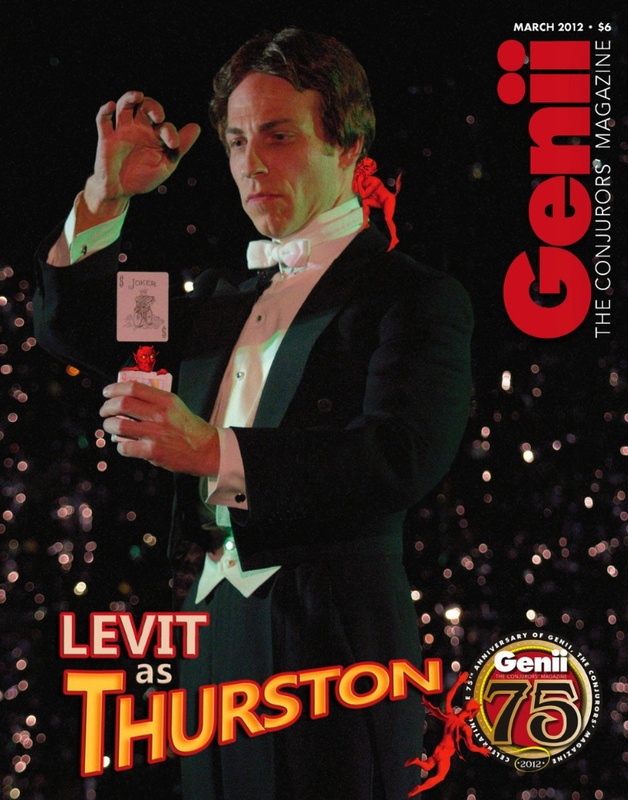 First is the March 2012 issue Genii Magazine with Howard Thurston on the cover. 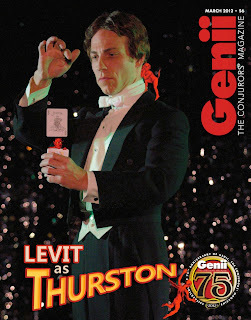 Ok, it's not exactly Howard Thurston, it's Jonathan Levit portraying Thurston at the L.A. Conference of Magic History. The article "Thurston LIVES" is by Jim Steinmeyer and David Regal and is an interview with Mr. Levit about his role as Thurston. It's excellent. While on the topic of Genii Magazine, there is a fantastic monthly column by John Gaughan called "The Chamber of Secrets." My one complaint about this column is it always leaves me wanting MORE! And that's a good thing actually. The articles are brief glimpses into magical apparatus from yesteryear and the articles are concise enough to draw in even those who are not usually interested in history. Believe me, they are worth checking out. In the past, he has covered The Hofzinser Rose Mirror, Antonio Diavolo the acrobat automaton created by Robert-Houdin, Joseffy's Rapping Hand and many other amazing curiosities. 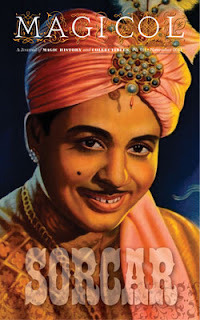 Please go to www.geniimagazine.com to check out more and if you aren't a subscriber, now is as good a time as any! 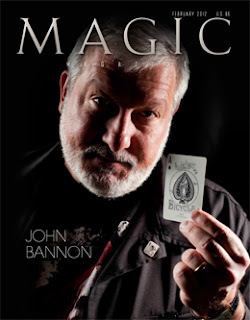 Another fabulous periodical on magic history is the Gibeciere by the Conjuring Arts Research Center. These are the same folks behind AskAlexander.com. Thanks Joe for the heads up on this. I can't believe I forgot to include them initially. If you are wondering where 'The Magic Detective YouTube Show' is, well, it's coming. The debut is getting pushed back to March. I'll be doing what a friend of mine calls 'a soft rollout'. Meaning, the show will grow in content as we move forward but in the beginning I'll be keeping it fairly short. The first episode is going to feature a video of my friend Steve Baker almost getting killed, FOR REAL, in Venezuela. I'll also share with you some behind the scenes things that Steve told me regarding the escape both before, during and after. It's a shocking piece of video, and yet I hope you enjoy it! I received a very kind email from Jonathan Pendragon regarding the article I wrote about him. Well, Jonathan was nice enough to put a link on his Facebook page and that one article shot up past all the others to take the #1 spot! I was thrilled. Well, as of this week, we have a new #1, the article on HUGO and the Real George Melies has now gone past the Pendragon article. I can say, those two will probably fight it out for some time jockeying back and forth between 1&2. They are both good reads and if you missed them, click on their links. Can't wait for the YouTube Show to start! Thanks Joe, I can't believe I forgot Gibeciere. I made sure to add them above! I'm still fuming that I was shut out of the Magic History Conference. What does one have to do to be considered "worthy" of an invite, I wonder? But I did get to see Levit as Thurston at Magic Castle. He was great. I don't think it's a matter of worthiness. They have a limited number of spots and don't add to the numbers. But they do have a waiting list and folks do get added as others drop out, but the numbers remain the same, from what I understand.